Are you ready to go short? Cutting long hair short is not a process one should rush through. You should understand the potential advantages and disadvantages of going short before you make the first snip. 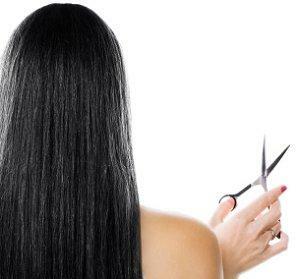 Cutting long hair is one of life's great dilemmas and this is especially true if you've had long hair for some time. In fact, many individuals flirt with the idea of cutting their hair short only to be scared off because they are not sure if a short hair style will suit them. So how can you know for sure? Flattering: Cutting long hair is a fantastic way to draw attention to the delicate features of the neck and collarbone, features that too often go unnoticed. While it's true that you can just throw your hair up in an up do, or a ponytail of some sort, more often than not, that can be a time consuming process. A short cut means that these fantastic features are always on display. Face Structure and Features: A short cut will not only bring out one's neck, collarbone and shoulders, but it will also put your facial features on display. This can be especially beautiful if you have farcical features (for example the eyes or lips), that often receive compliments. Just keep in mind that the same is true even if you don't have particularly flattering features. Easy to Care For: Many consider a short cut simply because it can be so easy to care for, especially those cut in the wash-and wear style. Not only are the cuts convenient, but they can also save you a ton of time in the morning; while you longer haired pals are fiddling with curling irons, you'll be well on your way to starting your day! Limited Choices: As cruel as it may be, there really are a limited amount of styles you can wear with short hair, but this doesn't necessarily have to be a problem. Look at fashionista and ska-rocker Gwen Stefani; she's always creative with her typically short hair. Braids, twists, spikes, nothing is out of the question for this stylish singer. Regrets: Some people do have regrets after going short, but it's usually only because they haven't taken the time to consider all of their styling options. Don't make that mistake. If cutting your long hair short has always been a dream of yours, don't let regretful thoughts infiltrate you mind. Instead, know what styles (and styling tools) you'll need to have on hand to ensure that your look works perfectly, day after day. Find your perfect short style. If you are still hopelessly confused about whether or not to go short, speak to your hair stylist. A hair stylist is a trained professional who should be able to describe or tell you your face shape and the best hair styles for you. If you tell him or her that you've been thinking of going short, and get an enthusiastic thumbs up, you know you're good to go. Cutting long hair short is not an easy decision to make, but if you consider your options carefully you should be able to make the right choice. Remember to go slow (don't make a rash decision), know your face shape, and talk to a professional. This way, you'll look great no matter what.